we're going bowling and we want you there! Join us for a fun (yet competitive) afternoon of bowling at Andy B's in Bartlett. 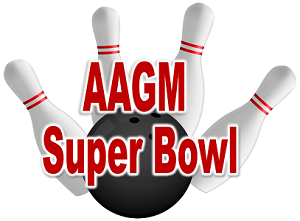 Help us reach our NAAPAC goal by registering your team to compete for the soon-to-be-coveted AAGM Bowling Trophy! The winning team gets bragging rights for the year and their team name etched onto the trophy for all eternity. All proceeds go to NAAPAC. Competition for the trophy is limited to 6 teams of 6. Individual bowlers are welcome too! All proceeds go directly to NAAPAC. For this reason, we will only be accepting credit card payments (invoicing will not be available). Please log in to reserve your team or individual ticket.